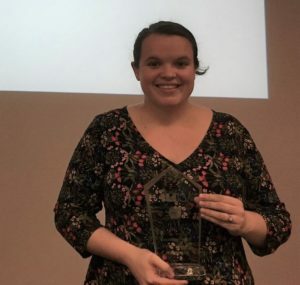 Penn Manor technology education teacher Molly Miller has been named the Secondary STEM Teacher of the Year by the Lancaster County STEM (Science, Technology, Engineering and Math) Alliance. Miller, who teaches Honors Engineering Principles, AP Computer Science, Applied Science and Exploring Tech courses at Penn Manor High School, was nominated for the award by assistant principal Jason D’Amico. Miller leads student clubs to promote technology at both the middle and high school levels and has helped developed new classes in engineering and computer science, D’Amico said. Award applicants submitted examples of lesson plans, videos of classroom instruction, their educational philosophy and other materials to a panel of technology industry representatives and post-secondary educators who selected the award recipients. Candidates were evaluated on how well they are implementing an innovative, inquiry-based curriculum that includes real-world applications of technology and addresses the needs of students with diverse backgrounds and abilities. This is the fourth year for the awards, which are sponsored by the Lancaster County STEM Alliance and the Steinman Foundation. Congratulations to Ms. Miller, who received her award May 23 at the STEM Awards Banquet.